Paul Edmunds’ solo show at Stevenson Johannesburg, entitled Season, comprises a series of sculptures, prints, drawings and installation. 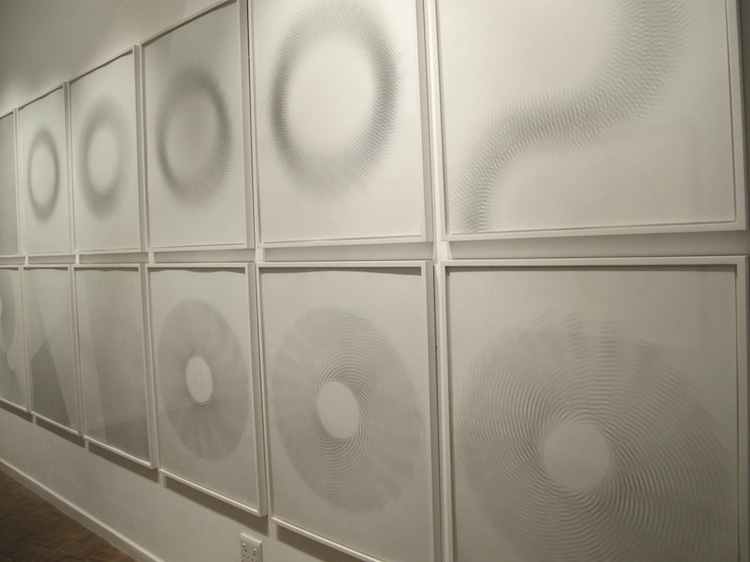 The works further the artist’s exploration of the sensory phenomena of light, shadow, form and gravity, which he first embarked on in 1997 with the woven sculpture Moon. The woven rock and insulation wire orbs form the one body of the exhibition. 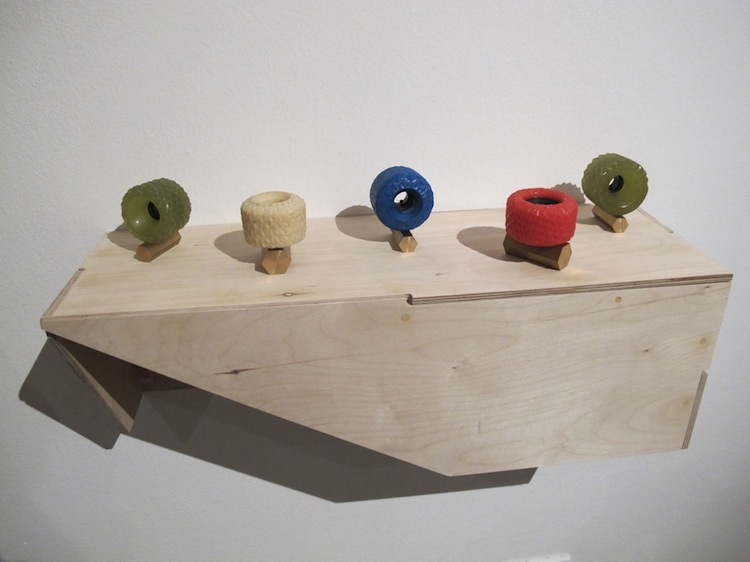 Each one is individually exhibited on a plywood pedestal, alone in a sea of gallery space. As you look at these oblong spheres, a kind of gravitational pull draws you in, to look closer and become mesmerised by the intricacy of the wire surface. These sculptures become micro planets, orbiting the room. On the adjacent wall is a cluster of space debris fixed to a plywood shelf: different coloured skateboard wheels, the surfaces of which have been meticulously carved into geometric patterns. Light refracts off the cut surface, making them twinkle like doughnut shaped stars. 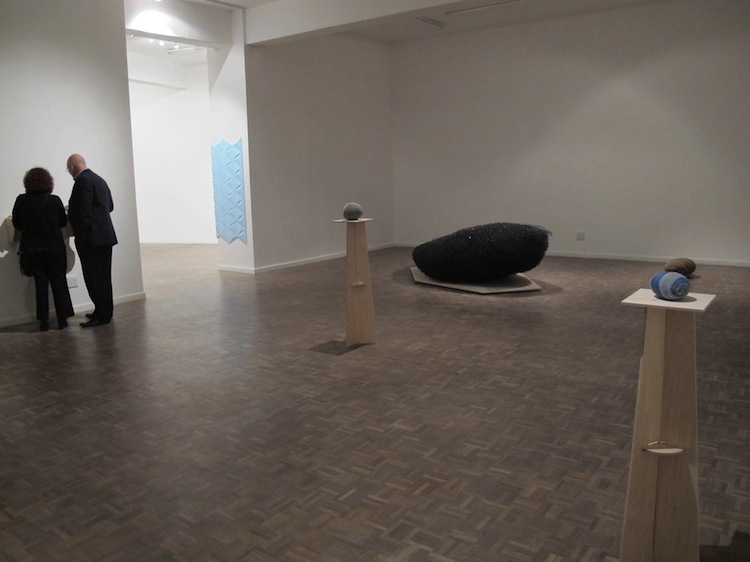 Across the other side of the space is the two-part sculpture Orbit, which previewed on the 2012 Joburg Art Fair. This work sets the planets free of their pedestals, adrift across the gallery floor. The larger body is made up of layers of flat wire mesh, piled layer upon layer to build up 3-dimensional volume. 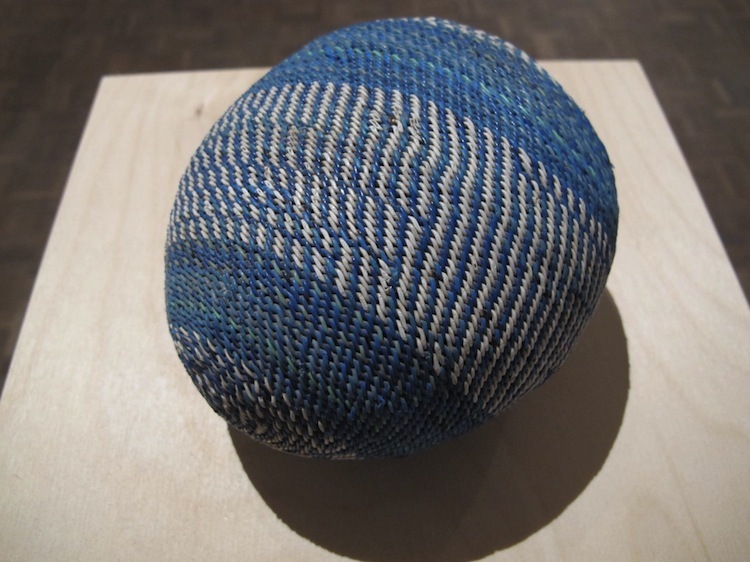 This airiness is starkly contrasted by the dense solidity of the second part of the work: a smaller orb of wire woven around a stone core set a few meters off to the side. These two opposite planets look like they want to pull apart from one another, but cannot; they each exist because of the other, they’re locked in a cosmic bond on the gallery floor. A pale blue geometric wall panel, Model, skirts the corner of the one gallery space and wraps around into the second space. This flat 3-dimensional piece moves the thematic of the show into the 2-dimentional space, where the medium shifts to large prints and drawings. The two prints, Shade I and Shade II, and Surface, are 2-dimentional works that are made 3-dimentional through optical illusion. This is repeated, 12 times, in the drawings that run across the wall of the very back room of the gallery. These drawings are comprised of minutely fine lines that arabesque across the page, or criss-cross in tapestry grids. The lines are so light, and the gradient so precise, the forms seem alive; the lines fine hairs on the back of some spirit beast. The disparate elements of this show fit together with the same kind of arbitrary yet perfect order that seems to govern bodies in the universe. The works float in the gaping gallery space, lost; yet also defined by the negative space. This interplay is uncomfortable, and you find yourself long to fill the space, with stuff, with anything, to feel less alone, less self-conscious of your own insignificant place in the universe. The exhibition is a micro-miniscule universe, orbiting on its axis within the room, the city, the country, the world, the galaxy, the universe. The interplay between macro and micro is further enacted in the creation of the works that make up the show. Edmunds explains: “The works are stripped back to few variables, allowing an in-depth exploration and the registering of small changes. From this address of the particular, the universal is inferred and in this process, I examine my experience as a human animal held by gravity to a large orb, suspended in a near-vacuum, warmed by a star”. And so the spheres, the cut wheels, the printed patterns, at first glance featureless and ambiguous, each become particular. Looking at the works imbues them with the personal, transforming them from featureless objects into subjective representations of space in time. * All images © Layla Leiman. The Season exhibition runs until 9 August 2013 at the Stevenson Gallery in Johannesburg. Nice piece, and the second last photo really conveys the sense of unease described in the text. Is the show coming to CT?